Not a referendum on polygamy • Candidates stress that they want everyone, FLDS or not, to have a voice. Trent Nelson | The Salt Lake Tribune Utah Lt. 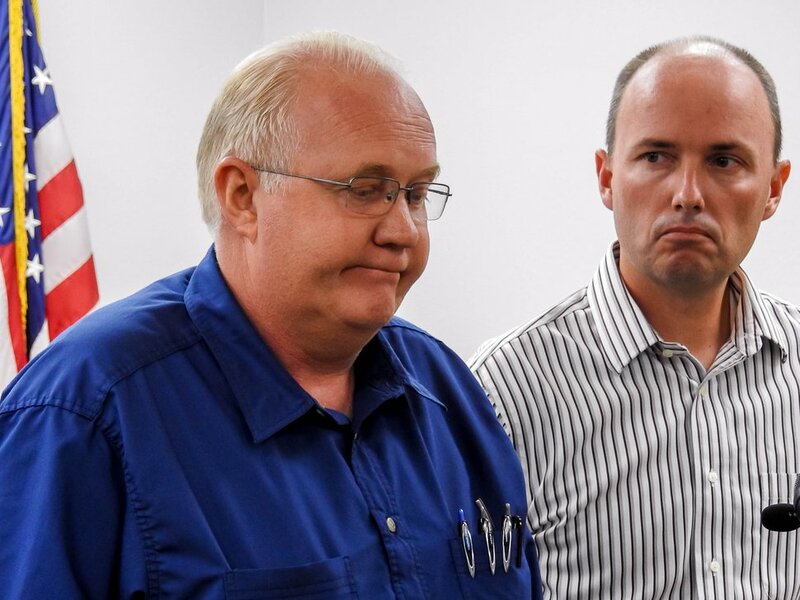 Governor Spencer Cox, right, speaks with Hildale Mayor Phillip Barlow at left, after nine people were killed and five remained missing Tuesday morning, the day after an SUV and a van were washed off a road during a flash flood in this polygamous Utah-Arizona border community. Through all the troubles they've had the past 15 years — arrests, lawsuits, the seizing of homes — members of the polygamous Fundamentalist Church of Jesus Christ of Latter-Day Saints held all the seats on the municipal governments of Hildale, Utah, and adjoining Colorado City, Ariz. Now that might change. Hildale will hold an election Nov. 7 for mayor and three of its six council seats. While the election is nonpartisan, two unofficial parties have emerged. Each of the four offices on the ballot has two candidates — one who is still a member of the FLDS, according to locals, and one who is not. 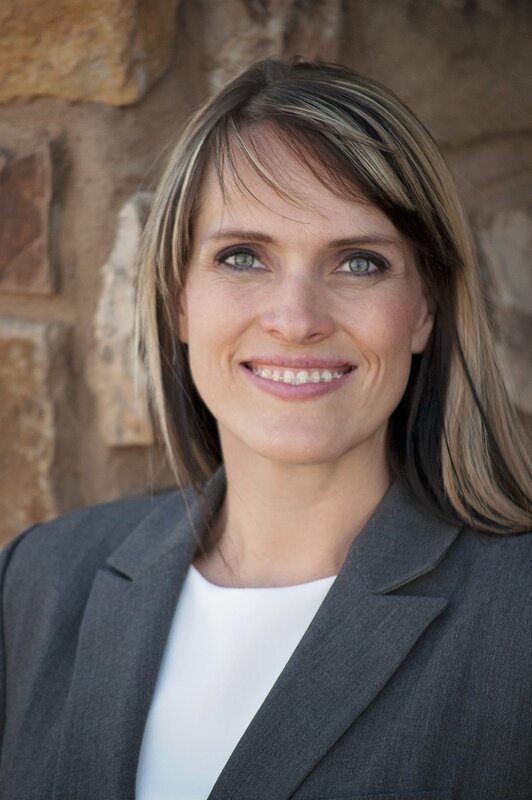 "It's actually going to be the first official election held in Hildale," said Donia Jessop, a candidate for mayor who left the FLDS four years ago. "Like, we're actually going to have a campaign and hold an election where people can choose who they have in office." Previously, according to Jessop and others who used to belong to the church, FLDS leaders told everyone whom to vote for through word of mouth. Even on the rare occasions that someone who wasn't an FLDS member ran for office, the church members had the numbers. It's unclear if they do this time. Perhaps hundreds of FLDS members have moved from Hildale and Colorado City rather than cooperate with their former land trust, called the United Effort Plan, which Utah seized in 2005. In recent years, the trust has sold or is in the process of selling about 80 percent of the homes in Hildale. Some in the town estimate that a majority of Hildale residents are now non-FLDS. Colorado City, where property transfers have been slowed by a dispute over how to subdivide parcels, does not have a municipal election scheduled for this year. Incumbent Hildale Mayor Philip Barlow, who is running for another term, acknowledges new people are moving into town. But he said he doesn't know what the religious split is in Hildale and isn't concerned with it. "I don't know anything about any churches because I haven't checked with anybody about what they are," Barlow said. "So that really is a nonfactor." 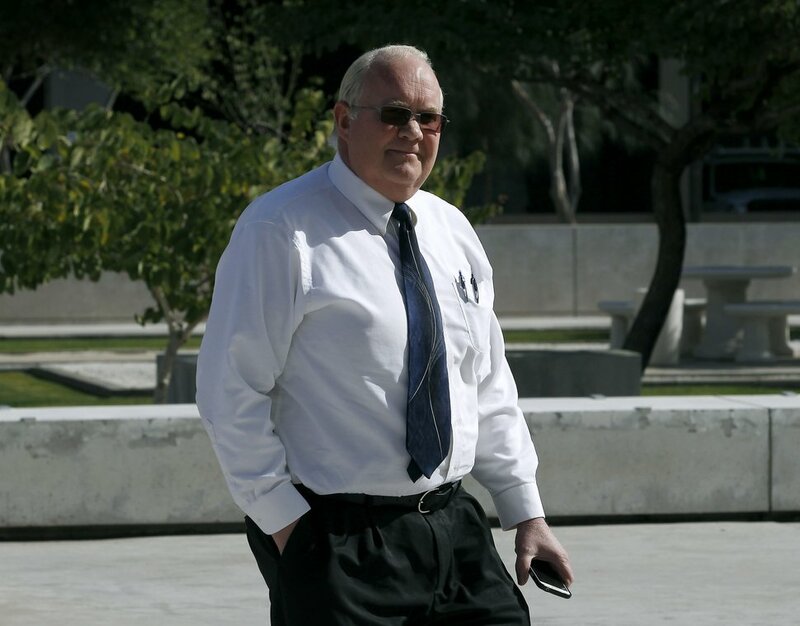 Barlow, who declined to speak about his own faith, is 54 years old and works at Streamline Automotive — a Hildale business that has appeared in court records through the years as being an employer of faithful FLDS members. It's unclear how the FLDS slate was selected. For the non-FLDS candidates, there was a meeting April 28 at Water Canyon School that worked much like a party convention. Candidates made their pitches to the voters in attendance, who selected the nominees. A few people who appeared to still be FLDS members attended and voted, said Jared Nicol, a candidate for City Council who was nominated that day. The non-FLDS candidates say they have no opposition to anyone just because of the church to which they belong. Maha Layton, 30, a candidate for a council seat who lived in Hildale until age 15 and returned four years ago, says she has some family who are FLDS and some who are not. 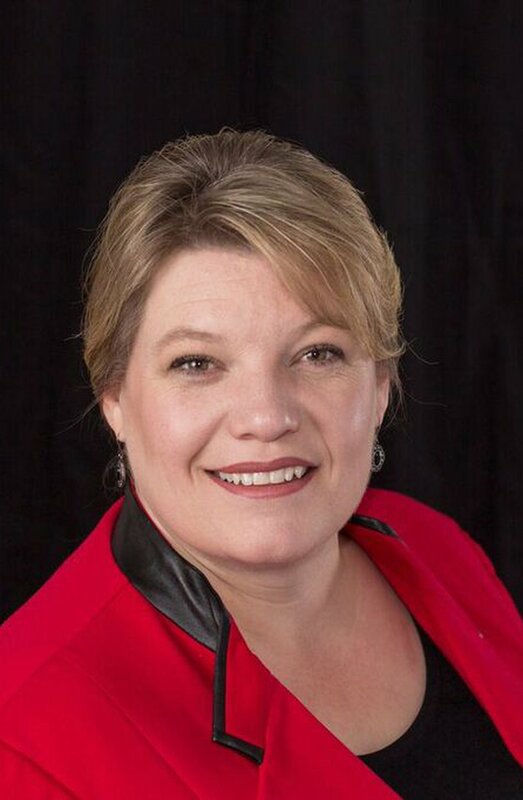 "It's easy for me as a councilwoman to know that I can represent all Hildale citizens," she said. "It's not two-sided to me." 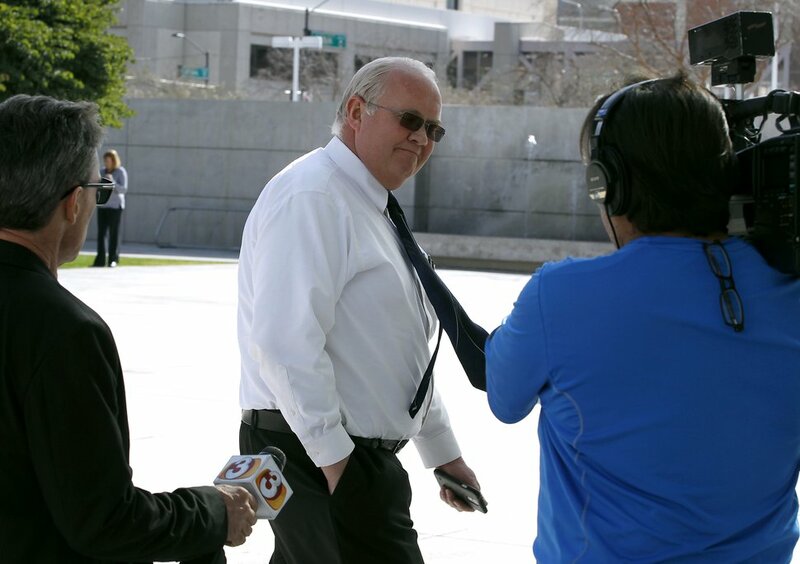 Layton and the other non-FLDS candidates say they just don't like the way Hildale has been managed and how people who do not follow FLDS President Warren Jeffs, who is serving a sentence of life in prison plus 20 years in Texas for crimes related to his sexually abusing two girls he married as plural wives, have been excluded from decisions. The town's insurer has paid millions in settlements in recent years to end civil rights suits that accused Hildale and Colorado City of favoring FLDS members. Both towns are about to receive a court-ordered monitor to observe council meetings and other municipal functions and report to a federal judge whether any discrimination or favoritism is continuing. In the mayor's race, both Jessop and Barlow talk about ensuring Hildale has enough drinking water, but Jessop wonders why the town government is buying new lots to drill wells when there are lots available through the UEP. She believes it's another example of the FLDS refusing to work with the land trust. If elected, Jessop wants to go through the town budget to see where money has been spent and what employees have been paid. Many of the non-FLDS residents have complained Hildale and Colorado City do not provide enough information about their finances. "It's like we're buying a farm, sight unseen," Jessop said. "We have no idea what we're going in on." Barlow said he and the town's council have worked to take care of infrastructure. He points to how Hildale is applying with the state for grants and loans to improve flood control there. A 2015 flash flood in Hildale killed 13 people. Both Barlow and Jessop talk about wanting to provide good municipal services to Hildale residents — all of them. Jessop makes it a point to say that she doesn't want to drive away the FLDS members. "Those are my family," Jessop said. "I don't want them gone. I will want them to stay. I will want them to keep their homes." There are worries about how fair the election will be. 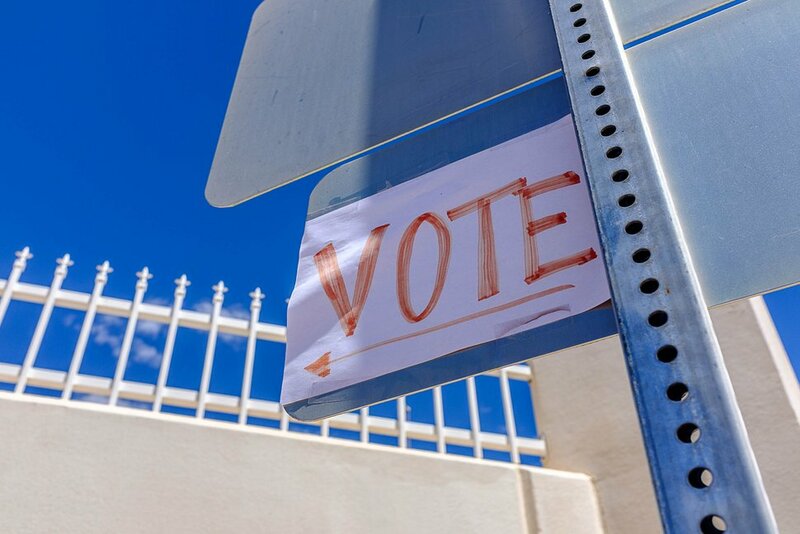 Many FLDS members work out of state, and the non-FLDS residents have been concerned people have registered or will register their addresses in Hildale and cast absentee or mail-in ballots. Jessop said supporters of a new municipal government are going door-to-door in Hildale and asking whether the registered voter really lives there. When the answer is no, Utah law allows submitting a challenge to the official responsible for the election — in this case the Hildale city recorder — who sends a notice asking for proof the person is eligible to vote. Mark Thomas, director of elections in the office of Lt. Gov. Spencer Cox, said Cox and other state election officials have already visited Hildale to train municipal employees and candidates on procedures. Hildale has contracted with the Washington County clerk to run the election. The mayor's race, at least, will not be a referendum on polygamy. One of Barlow's sons told The Salt Lake Tribune last year that the mayor has two wives. Jessop says her husband has a second wife she calls her "best friend." No debates are scheduled between Barlow and Jessop. That's OK with Jessop. She says Barlow and the other FLDS candidates are already under stress to represent the FLDS, and a debate might cause him to say something the leaders don't like. "I know the pressure they're under," she said. "I'm not about making them miserable or uncomfortable." Trent Nelson | The Salt Lake Tribune Hildale Mayor Phillip Barlow, left, speaks with Utah Lt. 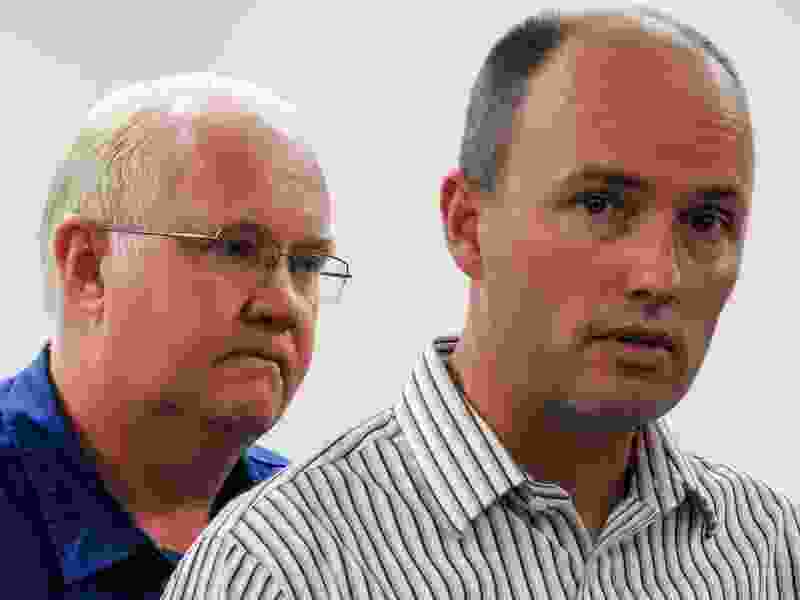 Governor Spencer Cox at right, after nine people were killed and five remained missing Tuesday morning, the day after an SUV and a van were washed off a road during a flash flood in this polygamous Utah-Arizona border community. 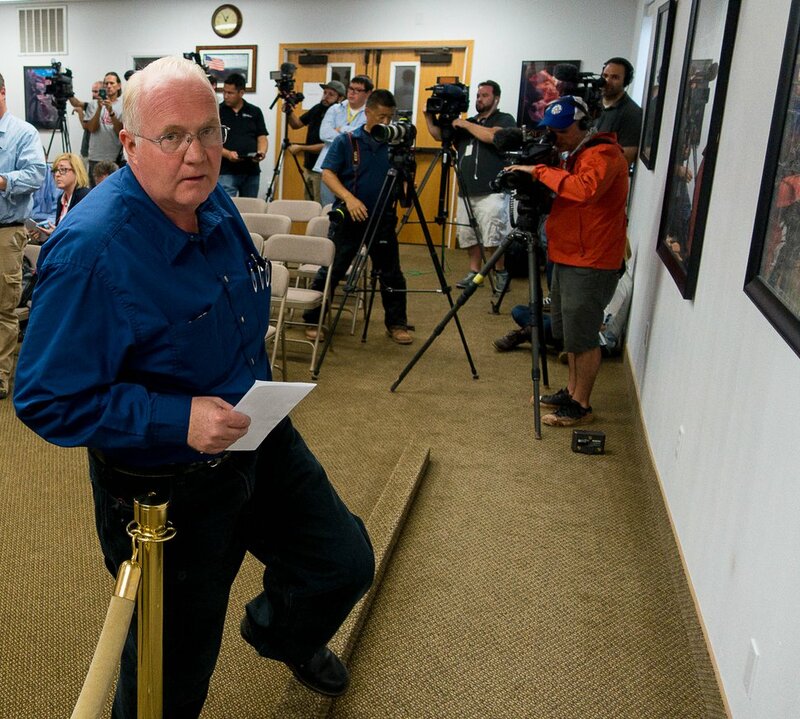 Trent Nelson | The Salt Lake Tribune Hildale Mayor Phillip Barlow leaves a press conference after nine people were killed and five remained missing Tuesday morning, the day after an SUV and a van were washed off a road during a flash flood in this polygamous Utah-Arizona border community. Trent Nelson | The Salt Lake Tribune Posted in front of a mansion constructed for imprisoned FLDS leader Warren Jeffs, a sign encourages locals to vote in a primary in Hildale, Monday May 1, 2017. | Courtesy Maha Layton, candidate for Hildale City Council.